With the report of Phil Cavarretta's passing, a few New York Mets shared their thoughts on their former hitting instructor including Mets manager and Hall of Famer Yogi Berra. In a statement released through Dave Kaplan of the Yogi Berra Museum and Learning Center, Berra recalled Cavarretta's talents as a player and a coach. "Phil was a heck of a hitter, just look it up," Berra said. 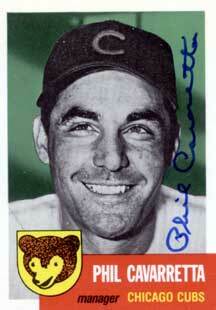 "Bob Scheffing (the Mets GM) knew him well, they played on the Cubs together and brought him in as an instructor. Phil was good, he knew hitting and was a good help to us. I remember him as a good baseball man and a nice fellow." Outfielder Jim Gosger was fond of Cavarretta's coaching approach as it was a direct contrast from another Hall of Famer he played for, Ted Williams. "Phil was a great guy working with us hitting wise," Gosger said. "He just had a knack that made you enjoyed listening to him. I had a few other great instructors [Ted] Williams and them, but Phil was a pretty quiet person. Williams was pretty wild, screaming and hollering. Phil was very quiet as opposed to Williams who was very verbal. "If you had any questions or if you wanted to talk baseball, he was great. He would never approach you and say, 'Hey this is what I did a long time ago.' He would never say that. You would have to go and inquire from him and ask, 'Phil is this a good idea? When you played was this the right thing to do?' That's the way he was. He was quiet but if you needed something answered he was very direct with you. Phil had no enemies. He was an easy going fun loving guy to be around." Jack Heidemann was an infielder with the Mets during the 1975 season trying to find his place back in the majors after suffering a major knee injury a few years prior. As a fellow infielder, Cavarretta took a liking to him right away. "I came over from St. Louis and he helped me in Spring Training that year," Heidemann said. "I was still a young guy then, I was coming off a pretty good year with St. Louis and I had a knee operation in St. Louis that sent me back to the minors for two years after Bobby Murcer took me out in Cleveland. I was coming in and he took me under his wing. He liked me because I was an infielder too. "He was like Alvin Dark, very low key, but not a manager or coach that would just go ballistic like a Earl Weaver. 'Cavvy' could give you the look now, but he didn't show you up. He was to the point but he wasn't a rah-rah guy. He expected you to do your job and that was it. He wasn't somebody who would pull you by the side and say, 'Hey you've gotta do this and you've gotta do that.' He never downgraded, it was always, 'You can do better or try this, try that, etc..'"
Cavarretta, who spent almost 50 years in baseball as a player, coach, manager, and scout, will be missed by the baseball community. He continued to interact with his fans through the years, remaining responsive to autograph requests until the time of his death.